Devis was born in Preston, Lancashire, on 12 February 1712, the eldest son of Anthony Devis and Ellen Rauthmell. Perhaps through the influence of the Liverpool portrait painter Hamlet Winstanley he became the pupil in London of the sporting and topographical painter Peter Tillemans. After the latter's retirement in 1733 he returned to Preston, and his earliest dated work, of 1735, is view painting. His earliest dated portraits are from 1741, and by the following year he is recorded as working in London. In that year he married Elizabeth Faulkner; and apparently the couple had twenty-two children. In 1745, well established as a painter of small-scale portraits and conversation pieces, he settled on Great Queen Street in Lincoln's Inn Fields as his base. 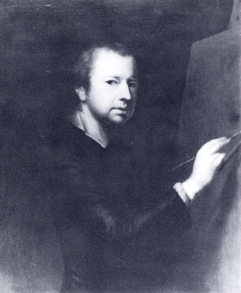 Many of his early commissions came from Lancashire Jacobite families, and were obtained through his father's local connections. In 1752 he took on an apprentice, George Senhouse, but was obliged to discharge him after three years for idleness; he had at least three other students. From 1761 Devis exhibited irregularly at the Free Society of Artists, of which he became president in 1768. It was in 1763 that Francis Vincent (then a Barrister of the Inner Temple) commissioned Devis to paint himself, his wife Mercy and daughter Ann at Weddington Hall. In this decade, however, Devis' reputation was eclipsed by that of Zoffany. Devis never exhibited at the 'Society of Artists' or the 'Royal Academy of Arts' and never competed for Associateship of the latter body. In later life Devis was active more as a restorer; between 1777 and 1778 he was paid one thousand pounds for cleaning and repairing the Painted Hall at Greenwich. In 1783 he sold his collection of pictures and retired to Brighton, where he died on 25 July 1787. The picture to the left is a self portrait of the artist. Arthur Devis is included here as he painted "Francis Vincent, his Wife Mercy, and Daughter Ann, of Weddington Hall, Warwickshire. 1763." See below for more details on this. (This is an edited version of the artist's biography published in the NGA Systematic Catalogue). Canvas. 42 x 39 5/8 in. An extraordinary feature of this late example of the work of Devis is the vertical division of the composition into two separate halves, with only a tenuous rapport between father and child to link them together. The narrative content of the painting is now lost, but at the time the artist was commissioned to paint the picture, Francis Vincent of the Inner Temple, Barrister-at-Law, received a message worthy to be recorded in his family history. 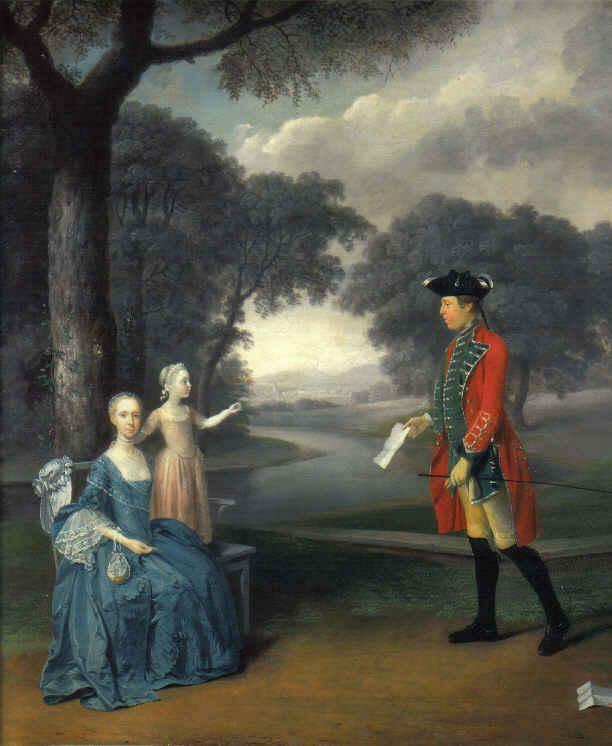 * Here he is shown presenting the letter to his wife, Mercy, who stares fixedly towards the spectator, leaving her daughter, Ann, uncomprehendingly presenting a sprig of honeysuckle to her father. Francis Vincent was the son of George Vincent of Colney Hatch, Middlesex, and Ann, daughter of Francis Stonard of the parish of St. Botolph, Bishopsgate, London. Mercy, his wife, was the daughter of the Rev. Dormer Sheldon of Abberton, Worcestershire. She first married Thomas Adderley of Weddington Hall, who died in 1757. The following year she married Francis Vincent, who himself died on December 20, 1766, aged 40. The young child in the painting is Ann, born 1759-60. There is, however, a question as to why a son, Dormer Vincent, born c1761, is not included in the painting. * A note written at the time the picture was relined, c1900, records that the envelope on the ground bore the inscription "Sir Frederick Vincent, Weddington Hall, Warwickshire". This is not now visible. No Frederick Vincent ever lived at the Hall, and it is probable that the abbreviation Fr. was expanded into the wrong Christian name. The content of the letter is now lost. ** See a similar landscape in the painting Gentleman in a Landscape, possibly Lieut. John Grey, 1758. PROVENANCE: T.B. Wirgman; Miss L. Thevenard, 1925, from whom purchased by the Harris Musuem and Art Gallery, 1957. REFERENCES: The Times, Sept. 11, 1957. D'Oench, list 165.